Castlen and real estate have been synonymous in Owensboro for 50 years. Beginning in 1965 and continuing through 1987, Elwood and JoAnn Castlen led the way in providing first-class real estate services to the people of Owensboro. Our company motto, "Service is our No. 1 priority," lets our clients and customers know how important they are to us. We strive to earn your respect and to develop mutually beneficial, long-term relationships built on trust. The new Castlen Dog Park is just around the corner! 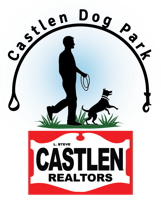 L. Steve Castlen, REALTORS is proud to be the naming sponsor for the park. The park is a great amenity for Owensboro and we definitely want to be a part of the park. The new Dog Park will be located in Yewell-Heritage Park near the former U.S. 60 Bypass on the citys east side. The Dog Park is still looking for additional funding.